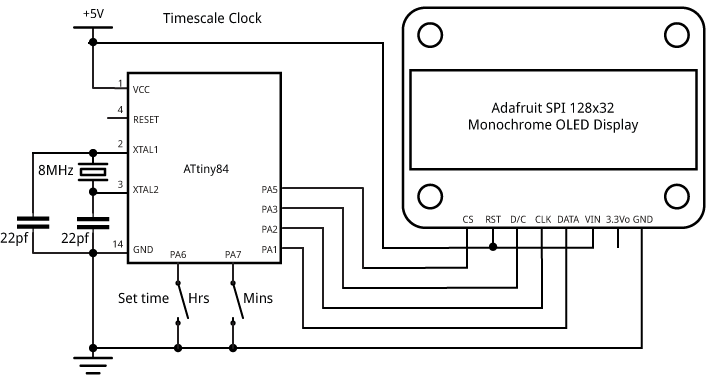 ATtiny84-based Timescale Clock. It's a quarter past 12. 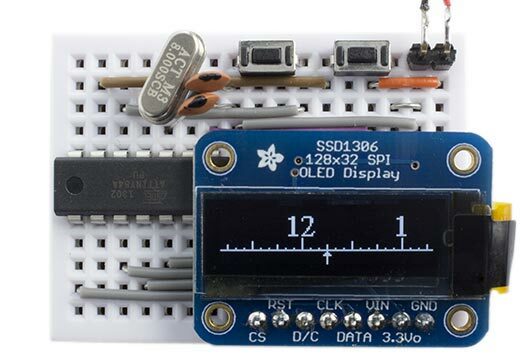 The clock uses a small 128x32 monochrome OLED display, run by a crystal-controlled ATtiny84. Alternatively you could drive the clock using an Arduino. You don't need the minute hand to be able to tell the time on a traditional circular analogue clock. If there's no minute hand, you only need to see the part of the dial close to the hour hand. This led to the design of this clock based on a small rectangular display, which shows just the relevant section of the clock face as a linear scale, a bit like the scale on some mechanical weighing machines. For the clock I chose a 128x32 OLED display, a small display about 2.5cm (1") wide with a very clear, bright monochrome display, and an SPI interface, available from Adafruit  or Proto-PIC in the UK . Despite what some tutorials say, you don't need a RAM buffer to use this display because it has its own internal memory. The display is divided into four 8-pixel high bands, referred to as pages, and you can write a vertical column of 8 pixels at a time. It's easy to write bitmap characters to the display; you just specify the page and starting column, and then write the character definitions for successive characters. For example, you could use it for a character display of 4 lines x 21 characters with just an 84-byte buffer for the characters. The display driver supports I2C, 3-wire SPI, and 4-wire SPI interfaces. In the 3-wire SPI mode the display distinguishes between control commands and display data using a 9th serial bit; in the 4-wire SPI mode a separate D/C pin performs this function. For their SPI version of this display Adafruit unfortunately chose to hard-wire it in 4-wire SPI mode, which needs an extra pin. My first prototype used an ATtiny85, but I realised that there aren't quite enough pins left over to use an external crystal for the timing, so I changed the circuit to use an ATtiny84, which provides plenty of I/O lines. The ATtiny85 would be fine if you were using an external time source, such as the DS3234 . The clock includes two push-buttons to allow you to set the time. One steps through the hours every second, and the other steps through the minutes every second. The clock can be powered from 3 to 5V, and takes about 8mA, so will run for about 5 days from a 1200mAH LIPO cell. For time-critical applications you could get extra speed by using the ATtiny84 USI port to implement hardware SPI, but for this clock software SPI is simpler and fast enough. You could use this same technique to convert arbitrary bitmap images and display them. I can give more information about how to do this if anyone's interested. This adds an ATtiny84 @ 8MHz (external crystal; BOD disabled) option to the Board submenu. Select this, and choose Burn Bootloader to set the fuses appropriately using the Tiny AVR Programmer Board; see ATtiny-Based Beginner's Kit. Then upload the program to the ATtiny84. Here's the whole Timescale Clock program: Timescale Clock Program. After designing this clock I discovered that someone had already come up with a similar idea , although it uses a mechanical scale rather than a digital display. I'd be interested to hear of any other designs along the same lines. 26th May 2015: I've just discovered another rather wonderful mechanical timescale clock, using digits on a bicycle chain: http://www.iainclaridge.co.uk/blog/1692. ^ BMP file format on Wikipedia. ^ Linear Clock by Euphy on Instructables.